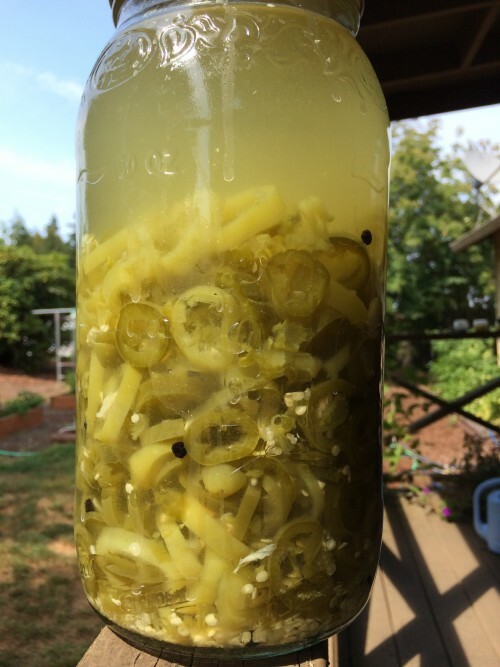 I had some free time and our garden was exploding…I decided to make good use of my time and take care of all those jalapenos! We planted 18 plants this spring. I know, that sounds like a lot, right? Yeah, it kind of is a lot. Michael panicked though. 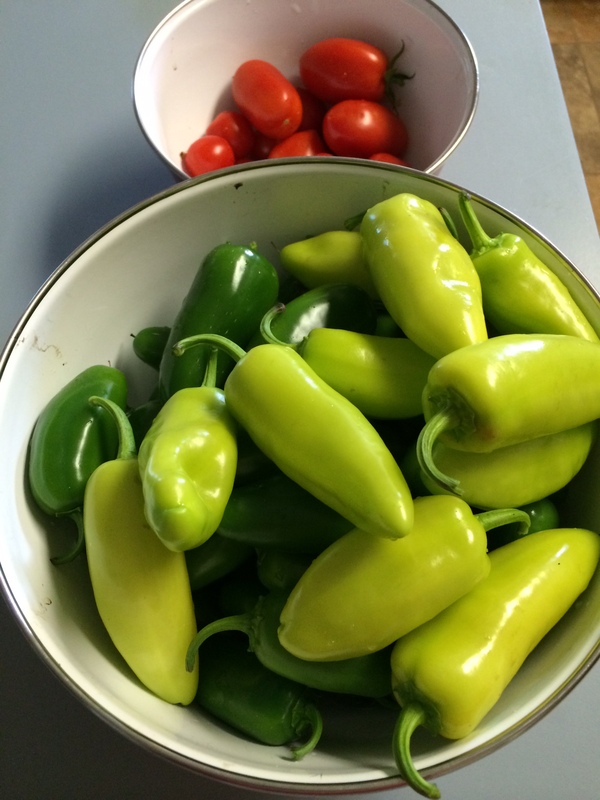 Last year we had a bunch of jalapeno plants and we ate poppers and pickled the jalapenos and gave a bunch away. Mid-winter we actually ran out of our pickled jalapenos (which has never happened before). So Michael was determined not to run out this time. Hence the 18 plants (and the one random plant that turned out not to be a jalapeno). 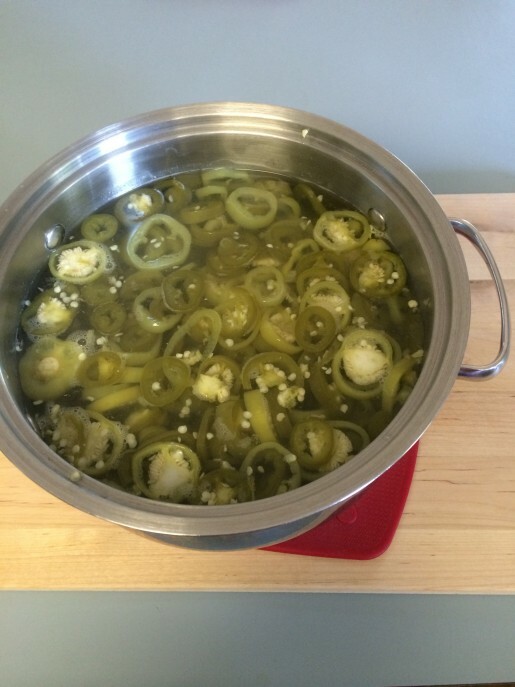 Use tongs to transfer the jalapenos into a clean jar. Ladle the pickling juices over top until you’ve reached the top of the jar. Let cool at room temperature before securing a lid and popping them into the fridge. I’m excited to try these jalapenos because I think doing it this way (instead of just putting them in a jar with vinegar in the fridge for months) is much faster. I imagine these babies will be ready to eat soon! 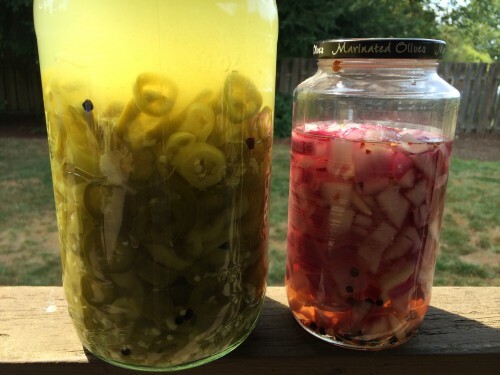 Look at these–the color was already different than the way we usually pickle them. I used a ladle to get the liquid and pepper rings into a big jar. In the jars with the liquid and peppers are some peppercorns and crushed garlic cloves. I tried to put as many of the jalapeno seeds in there as I could. I let the jar cool before sealing it and putting it in our spare fridge. I planned on testing them every week or so until I know they are ready to eat. Who knows, maybe they will be ready right away. We’ll see! The peppers didn’t take much time so I decided to try my hand at pickling some other things. Next up: red onion. This is something I’ve wanted to do for a really long time. I absolutely LOVE pickled things. No matter what it is, if it’s pickled, I’ll like it. 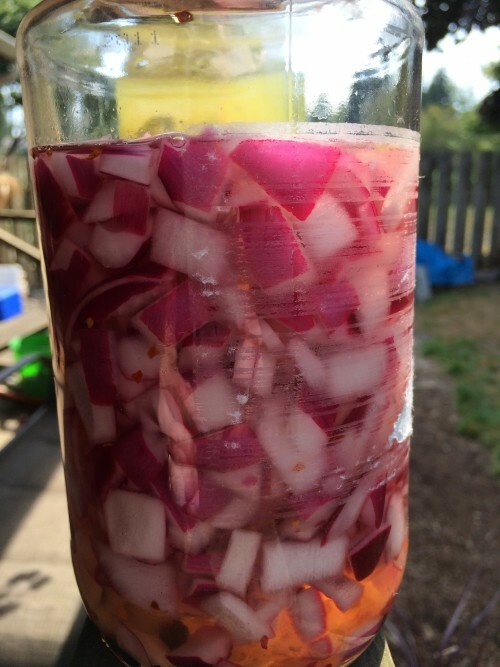 The recipe I found was for quick pickled red onion–which was perfect because I didn’t want to pickle it and can it for real, I just wanted a quick version that could go in the fridge and be ready soon. This recipe claims to be ready within a few hours of making them. I doubled the recipe for the onions because when I weighed them on my food scale it was closer to 12 ounces instead of 5 ounces like the recipe says. Slice the onions: Start 2 or 3 cups of water on to boil in a kettle. Peel and thinly slice the onion into approximately 1/4" moons. Peel and cut the garlic clove in half. Dissolve the sugar and salt: In the container you will be using to store the onions, add the sugar, salt, vinegar and flavorings. Stir to dissolve. Store: The onions will be ready in about 30 minutes, but are better after a few hours. Store in the refrigerator. They will keep for several weeks but are best in the first week. I’ve never par-blanched something before but it was super easy and I could tell the difference in the onions immediately after pouring the boiling water over it. After it cooled, I put the lid on tight and then shook it up a little to mix the peppercorns and garlic slices around in the liquid. I also added a little bit of red pepper flakes, but not tons. 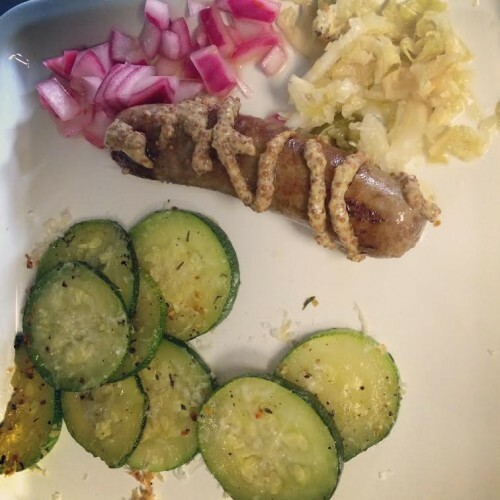 For dinner that night I made bratwursts with some sauerkraut (from Trader Joe’s–which is awesome) and I tried some of my pickled onions! I also roasted some zucchini in the oven with a little grapeseed oil, salt, pepper and parmesan cheese. My pickled onions were AMAZING. They were so good I couldn’t stop eating them! I even had some with a snack of crackers, cheese and tomatoes the next day at work. Love love love these onions. I will definitely be making more and will can them so I can make a bunch of store it in the pantry. Seriously, make this recipe! I wish I had more space to grow vegetables. 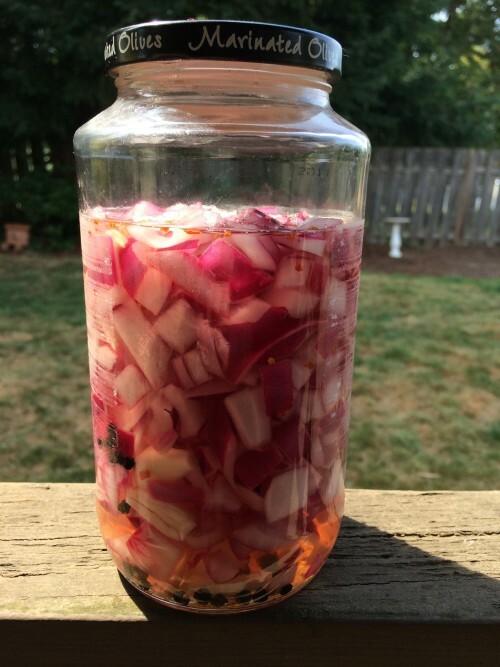 Pickled vegetables are wonderful, and your recipes sound great! Enjoy! I’ve seen some neat tricks on pinterest for small garden ideas. Check it out! I love pickled jalapenos and it has never occured to me to do them myself LOL! Yummers! They are delicious! And nice to have in winter. my MIL pickled some squash and zucchini and it was SO GOOD! Totally recommend it! Biz recently posted..I think I am getting a cold. 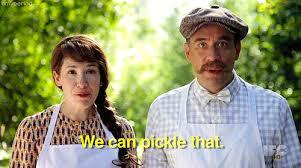 Pickled jalapenos are the best!